Twilight Sad / Copeland Guitars Miniature! 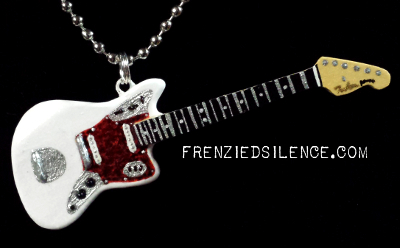 I still have several of these tiny Jazzmasters left! They are numbered, limited edition, and approved by The Twilight Sad. These miniatures are handmade: cut from the original block of wood from which Andy’s real guitar was cut, “painted with fire” just like the real guitar, and finished with spar varnish for extra protection. I can send out just a mini guitar to set on a shelf, or I can attach a ring so it can be turned into a pendant/rearview mirror decoration/etc. $20 from each guitar sale will go to MIND UK, in honour of Scott Hutchison. Postage included, these are $40ea within the US, or $46 worldwide. The “painted with fire” miniature, without pendant ring. Posted in Charity, Crafty, Music | Comments Off on Twilight Sad / Copeland Guitars Miniature! 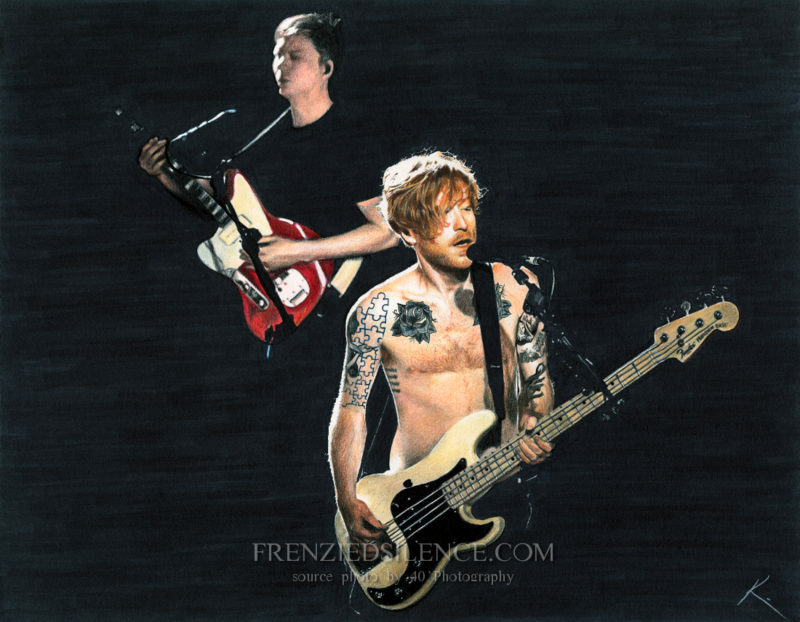 James Johnston and Mike Vennart of Biffy Clyro. This was commissioned by several friends for a very wonderful person. 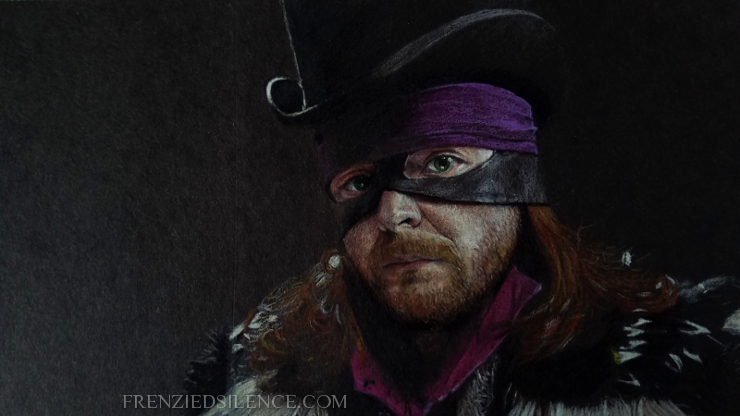 Prismacolor pencils, copic marker, and white gel pen on 11×14″ Bristol vellum. June 2017. Source photo used with kind permission from 40 Photography. A sketch that I did as cover art for a tribute EP. Prismacolor pencils on 8×8″ paper. Finished March 2017. The incomparable Mike Vennart testing out his custom made Telemaster. Commissioned by Copeland Guitars of Austin Texas. Prismacolor pencils on 8×10 paper. Finished 05 June 2017. ~18 hours. My newest drawing: The Dragon. Magician and one half of Scottish band Marmaduke Duke. Prismacolor pencils on 4×6″ black paper. Finished 6 December 2016. ~14 hours. A wearable version of the beautiful white Jaguar owned by Andy MacFarlane of The Twilight Sad. These are US$30 each, and $10 from every sale of this pendant will go to Yorkhill Children’s Hospital in Glasgow. 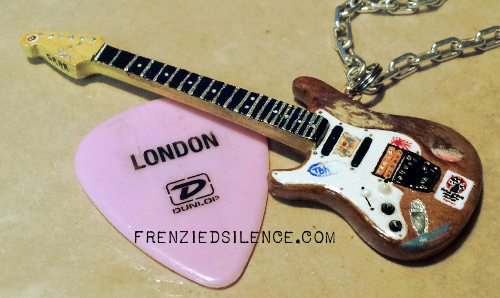 Made from polymer clay with birch veneer on the neck for strength. Varnished in water-resistant polyurethane. Each comes with an 18″ nickel-plated ball chain (not pictured). Posted in Charity, Crafty, Music | Comments Off on The Twilight Sad guitar! 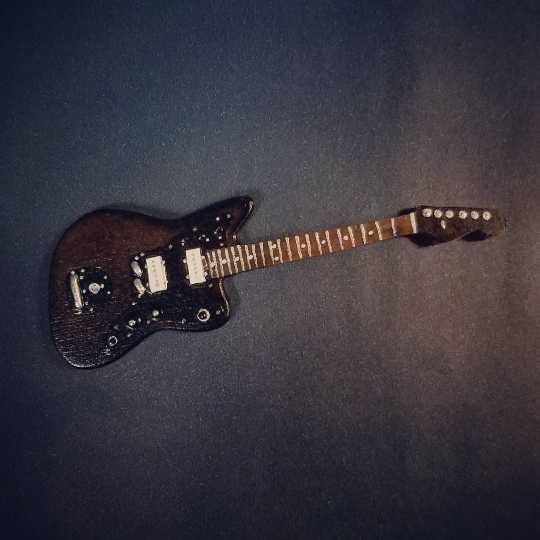 This is my tiny version of Mike Vennart’s very unique Stratocaster. I am very pleased to announce that, with Mike’s permission, I am now selling these handmade miniatures as necklaces (or wall hangings, or whatever)…. 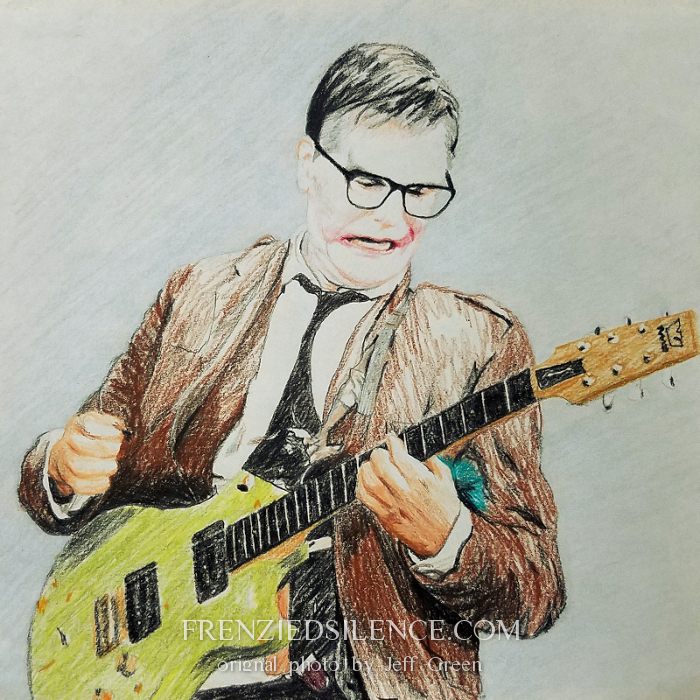 and a large portion of every sale will go to help Mike’s hero, Tim Smith, of Cardiacs. Tim was hit hard by major medical problems in the past few years, and we are very keen to help him with the huge costs of care. 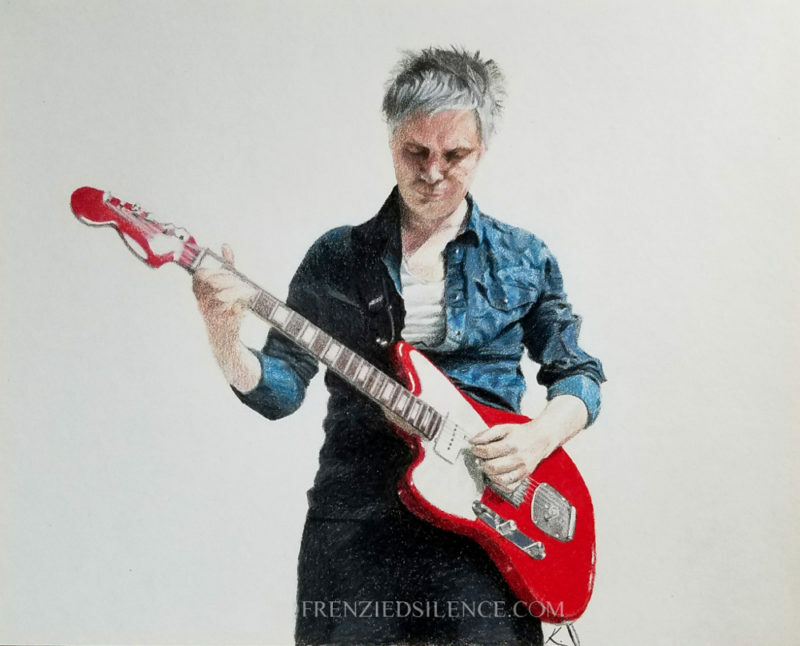 If anyone is interested in having a wee bit of artwork to show their love for the inimitable Vennart, and helping out a friend at the same time, each of these is US$40 (due to the very very intricate paint job that I do by hand each time), and $15 per sale will go on to help Tim Smith. These are available from my Etsy shop. If you wish to ask any questions, feel free to contact me on Etsy, or from my Contact page here.